Nectar allows you to build the perfect website for your business. You don't need any programming skills. You don't need to know how to code. All customizations take place with a very user-friendly theme options panel. Either check a box or enter some plain text and click Save--it's that easy! Nectar comes with free life-time updates and free support. Read below for the full feature list, as well as the FREE bonus. Nectar is 100% compatible with WordPress 4.9, 5.0, 5.1, & 5.2 and 100% compatible with Gutenberg. WordPress User Guide.pdf - A detailed walkthrough of how to use WordPress. Includes screenshots and instructions showing how to add new pages/posts, edit existing pages/posts, add images, and manage categories. 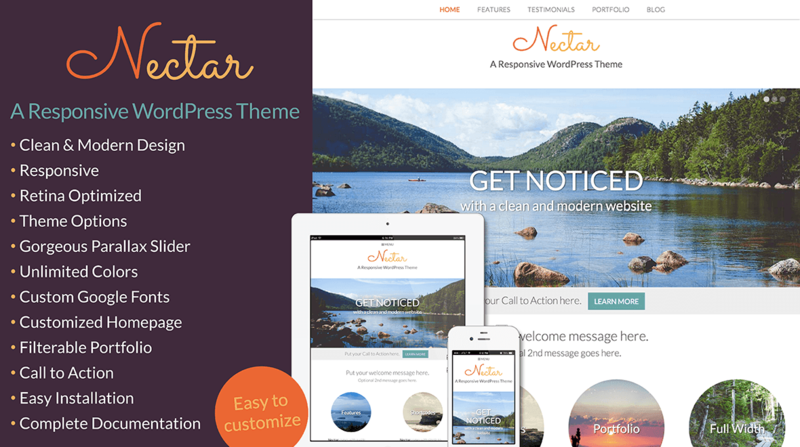 Nectar is a responsive WordPress theme. The clean, modern, and minimal design makes it perfect for any kind of creative, eco, business, or nonprofit use. It’s fully responsive and has been optimized for tablet and mobile platforms. It also is retina optimized to look incredible on high definition displays. It comes with a Testimonials page, a filtered Portfolio, and a gorgeous Parallax slider on the homepage. 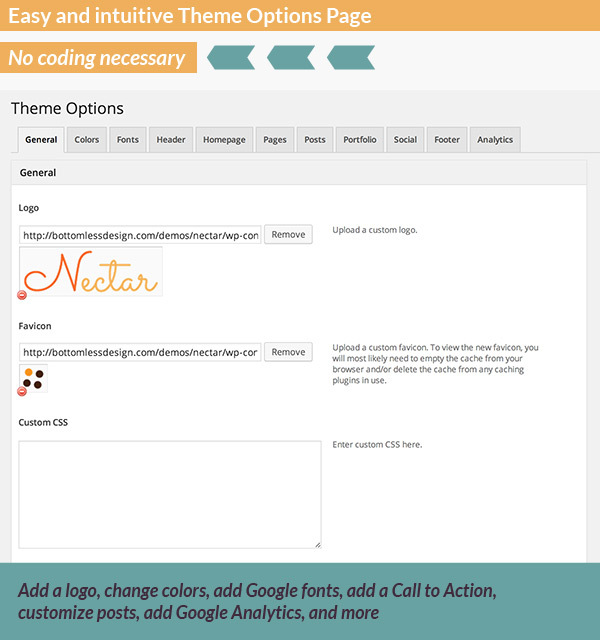 Featuring a Theme Options panel, Nectar is amazingly easy to customize. Change colors, use Google Fonts, add custom CSS, and more. The homepage is fully customizable, with the option to use or hide many features. Additionally, Nectar has a Call to Action feature that makes it easy to direct customers to your event, product, or newsletter signup. 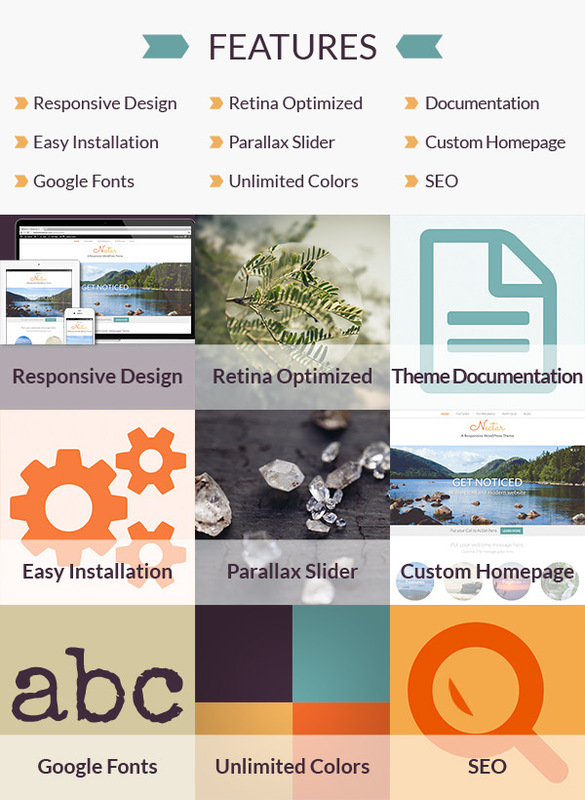 Make your next website project easy to realize and eye catching with the flexible and adaptive features of Nectar. Theme Documentation - Instructions for how to install and customize the theme to your website. All sections of the homepage are optional and can be turned on/off as needed. Please note: This theme (like all themes on MOJO) is designed to work on hosted installations of WordPress.org only. This theme will not work with WordPress.com sites.